Amazing we wake up to snow lying on the ground. Downstairs for another good breakfast. The landlord cant believe it we leave nothing on our plates, He says the dogs are used to residents leaving at least a sausage for them. Its wet, its cold again and we are on our way. country. A Farmer and his wife fighting with a sheep on the tops asks where are we going? "To Kielder" we reply, they shake their heads. We pick our way through the forest and into the snow. Apart from the odd Forestry vehicle there is nothing. 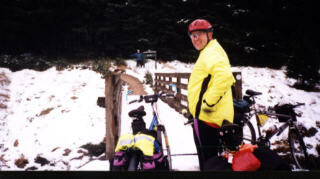 We follow the Kerhopeburn along the Border as we climb there is more snow. 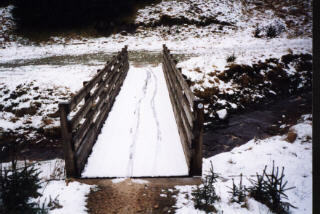 We climb steadily up the forest tracks with deep snow either side. 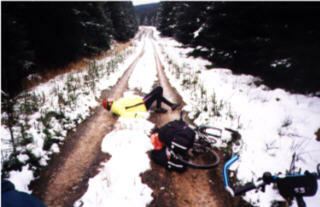 Then it starts to go down a gradual decent, I slide and lose control and end up in a snow drift after parting company from my bike. 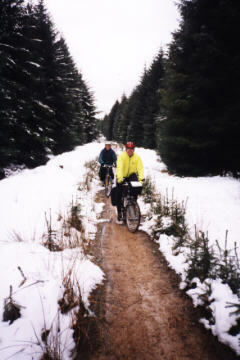 We eventually pick our way through the Forest tracks down to Kielder. We are passed on the way by three other Mountain bikers doing the Reivers with full kit. We're not the only clowns out in this weather. Graeme watches in quite amusement as the take the wrong road and disappear out of site. As we approach Kielder Leaplish water Park the weather has improved. We get our Reiver stamp the guy is more organised and feeling good with ourselves have Beer Burger and Chips. But there was a" sting in the tail", After a hour and half rest we climbed out of Leaplish then the wind got up and it rained and rained. It was also hilly not downhill to Bellingham as we thought. We had the wind the rain and two or three hard climbs before eventually we reached the Cheviot Hotel Bellingham so much for a steady day. The last 7/8 miles gave us a right kicking wind and rain and a few choice hills, it was 34 hard miles. Our reward was that the Hotel was good the bath very welcome our last night it was a hard last couple of hours. It was nice to go downstairs and enjoy a couple of beers and a good meal. We had a little leg stretch a pub crawl of Bellingham after dinner round the other two pubs I came to conclusion we were staying at the best so we rounded the night off with a nightcap at the Hotel and to Bed.